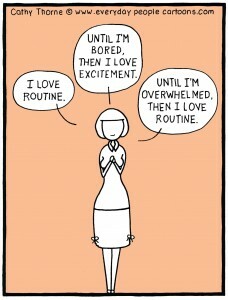 I’ve been reading lots of stuff about routines. 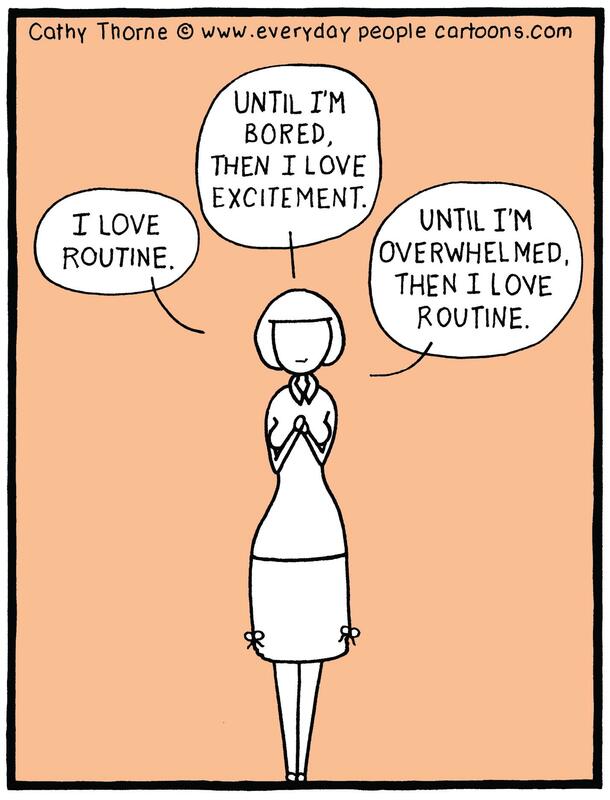 I do quite like a routine. Do you?! Today I thought I’d write about a super-important routine that really hadn’t crossed my mind before. It’s been irritating me a bit that I find it hard to start my work day. I drop the kids off at school, come home and I should get straight on down to work. It’s not like I haven’t got a lot to do. I have! And I love my work and I’m super- motivated. But somehow I still find it hard to get going. My days start early. I’m up with my smallest at 5:15 for a bit of Dora the Explorer and we head into a marathon two plus hours of getting three boys up and ready for school. No idea why it take that long but it does. I finally drop kids off at various places and head back home at about 8:15. If I was telling a different story I’d say that when I get home, I open up my computer pop my head down and do lots of work. What really happens is this. I pop the kettle on and start my computer. While they are both warming up I pick up a few stray clothes. That takes me to the laundry where I pop a load on and tidy up a bit. Then I remember the tea and go back to the kitchen to make it. While doing that I check my phone, read a few emails and wander down a couple of internet rabbit holes. When I reach a digital dead end I trundle off to my computer. Every day I promise myself that as soon as I sit down I’ll get straight into the work. But I don’t. I take a quick look at Facebook, my emails (again), my to do list (in case it’s magically changed), back to Facebook, quick detour onto a few articles and…..Well, let’s just say, by the time my tea is stone cold I’m ready to start. It drives me crackers. I’m totally short on time yet I’m too undisciplined to start work sooner. And nothing NOTHING I’ve tried seems to change it. But now I’ve discovered that this half an hour of faffing is actually really good for me. Oh my. Who would have thought?! Faffing is ‘tuning in’ time and we all NEED it. It turns out that we can’t just swap from “home head” to “work head” without some sort of transition. We all need routines and rituals to get us started. It’s kind of like tuning our minds into ‘work’. If you work away outside your home and have a decent ( 20 minute plus commute) your travel time tunes you into your “work head”. But if you don’t travel to work you need to do something else to tune up. Oh happy days! That’s a license to spend our first twenty minutes of the work day tinkering about. 1. We all need ‘tuning in’ time so don’t fight it. 2. Most of us need between 20 minutes and half an hour. 3. We develop an ad hoc tuning-in routine (me: tea, tidying, laundry, Facebook etc) but it’s fine to change it. I’ve ditched tidying the house and now just read with a cuppa! 4. “Tuning-in” time is a lovely way to start the day and makes us much more productive. Fancy sharing your ‘tuning in’ routine in the comments? 16 Comments on "How to get your work day started"
OK, so now I’ve dropped the kids at school, emptied the dishwasher, picked up some laundry, stacked some shoes, sorted some ironing, made a cup of tea and entered the world of social media for a little “catch-up”… The first thing I read is description of what sounds just like my morning! Every day I think “tomorrow I will get right into it, no messing about!” (or tidying, rather! ), but when next day comes, I get distracted again by the chores of daily life. I love the way you point out that we need this time to “tune-in”! It makes me worry less about my morning routine and more about creating a productive “to-do” list that I can attack once I’ve “tuned in”. I’m just starting my own business, and I find it’s very easy to get distracted in this transition period and very difficult to know what to focus on when. At least now I can enjoy my morning routine guilt-free, as long as I limit it to “tune-in” time! Thank you for giving me permission to “ease into the work day.” I choose to work late into the nights so I am far from a pop out of bed, bright-eyed and bushy tailed. EVER! I do find myself to be much more productive when I get in a little time to feed baby #1 while reading emails from my phone, get in a quick 10 minute work out, clean up the kitchen from the night before, grab my coffee, and read a little Facebook. Sounds like me too! I can’t believe we all do the same thing. But thank you for pointing out that we don’t need to feel guilty about it. Hehe, I lOVE how we all do it. Makes me feel so much better! I admire the working mums who have to get up so early and practically do half a day’s work before it’s 7 am! I’m not a mum but I do run my own business from home and I am an early bird – no so much wide-eyed these days! but nevertheless up early. I turn on ABC News (in case there is ever any interesting news! Plus I really like Michael Rowland! ), lie n bed for 30 min reading my emails and FB and any other interesting articles that catch my eye. Then it’s off to doing my exercise before starting work. The routine works for me. Oh Emilia that’s the kind of routine I would LOVE! Reading in bed in the mornings is the *best* way to tune into the day! I admire the working mums who have to get up so early and practically do half a day’s work before it’s 7 am! I’m not a mum but I do run my own business from home and I am an early bird – no so much wide-eyed these days! but nevertheless up early. I turn on ABC News (in case there is ever any interesting news! Plus I really like Michael Rowland! ), lie n bed for 30 min reading my emails and FB and any other interesting articles that catch my eye. Then it’s off to doing my exercise before starting work. This gets me in the for my work day. Popping over from blogging with Pip course, and my tuning in process sounds almost identical to yours. Though previously I always considered it more a wasting of time. Now that I know it’s actually conducive to what I’m trying to do I won’t feel so guilty about it!!! 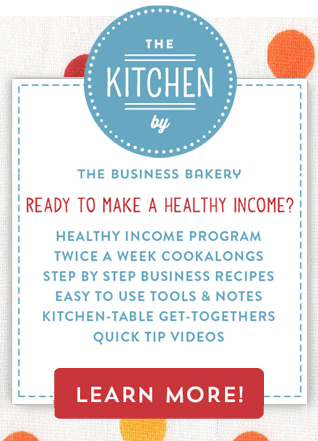 I suppose I did this without thinking when I started my business, but focused on the domestic side. After getting the children to school – 20 min walk each way (daily exercise done and dusted), my work day started at 10 am. Working from home, I had to have clear cut times. This gave me about an hour to do housey stuff everyday, which was just about enough with a boost at the weekends to keep on top of it. My partner was very apprehensive that I could, run a business and continue with the family stuff, and keep myself healthy (long term medical condition). I never thought of it as a transition between home and work, infact I remember being very proud that I had developed a way to fit everything I needed to in a day. Customers could come between 10 – 3 and this was my working day. Those that couldn’t come during the day came in the evening, but I made sure that the next day, I took the same time out as me time. My evenings were always me time. Now my children are grown up, I don’t have the school routine to work with. I do walk 10 – 20 mins as this gets my prescribed exercise out the way first. I hate it because I have to do it no matter the weather, my fitness level, mood. I still do housey things, but not quite as disciplined as before. I’ve been doing this for nearly 8 years now and the routine really works. One slight change is that my work hours are more fluid without the school routine, which has made my working day alot more relaxed – my only deadlines now are mine. But sometimes I do feel I need the pressure to get things finished to get into the post for when I would have gone back down to school for the pickup. Thanks for sharing this Julia it helps to ease off the guilt! I also want to say a bigthanks to Suzanne for sharing her routine. I’m having a hard time developing a routine that works this year and I can take some inspiration from yours!